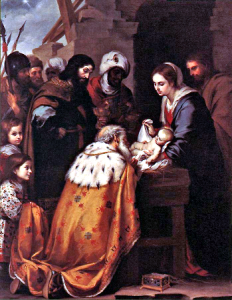 Epiphany Day occurs on 6 January and marks the end of the Christmas season except for the Orthodox Christians who follow the Julian calendar. In England it is celebrated as the Twelfth Night (remember the song the Twelve Days of Christmas). Many cultures celebrate it with special foods and it is considered unlucky by many to leave Christmas decorations up after the Epiphany. The Roman Catholic Church celebrates it on 6 Jan but not as a day of obligation. Usually it is celebrated in a Sunday mass that falls before or just after the date (2-8 January).